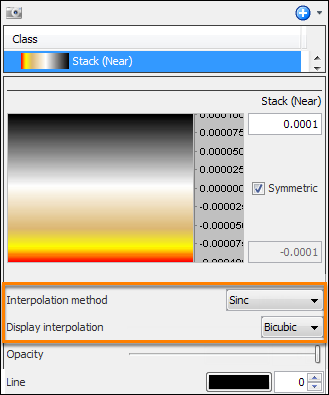 The Interpolation method controls how values are obtained when interpolating between samples, for example when performing an amplitude extraction or displaying a horizontal slice through a volume. In the Control Panel, open the Class tab (see Creating a Class). In the tree, select a class to open the Details Panel. At Interpolation method, choose the mode at which the values are obtained when interpolating between samples. Sinc — Use this for seismic data. Edge Detecting — Use this for blocky data, such as impedance volumes. Lagrangian — Use this for smoothly varying data, but not velocities. Linear — Use this for ZT and TZ velocity volumes. Nearest — Use this for integer volumes, such as "most likely LID". Interval — Use this for interval velocities. At Display interpolation, select an option to control how data is interpolated onto the screen when zoomed in. Select Bicubic for a smooth display or select Nearest to see individual bins. Nearest — Quickest to render but provides the lowest quality of result. Selecting this will apply the same value to all pixels within a bin, based on the nearest true bin value. Bilinear — A simple linear interpolation between adjacent points to render the colour information and is slightly slower than the nearest neighbour method. Bicubic — Uses bicubic splines between adjacent points to interpolate your data. This provides the best output at the expense of performance.